A traumatised woman whose friend has allegedly been murdered went on a wrecking spree at her mother-in-law’s home after a row with her husband. 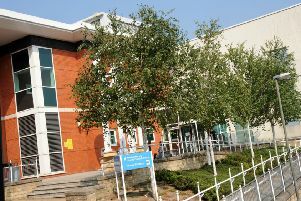 Chesterfield magistrates’ court heard on January 24 how Michelle Kerry, 51, of Wilson Avenue, Blackwell, Alfreton, damaged a patio door, a living room window and furniture valued at £1,500 at West View, Tibshelf, Alfreton. Prosecuting solicitor Sarah Haslam said Kerry had been out drinking with her husband and they had an argument before he left to go to his mother’s address. Mrs Haslam added that Kerry ended up shouting and swearing outside the property and the doors were locked to stop her getting in. Kerry smashed windows and furniture including garden furniture and admitted causing criminal damage after the incident on January 3. Defence solicitor Anise Rowlands said Kerry does not get a wage despite working with her husband in a family business and this created tension which led to an argument about finances. Kerry had gone to her mother-in-law’s to get a dog she was looking after, according to Miss Rowlands, but she was refused entry and a “red mist” descended over her. Ms Rowlands said: “She said a mist descended and she picked up a garden object and threw it through a window. Ms Rowlands explained Kerry had been suffering after the death and alleged murder of her friend in December and she may be suffering from post-traumatic stress disorder. The dog Kerry had been looking after had belonged to her deceased friend, according to Ms Rowlands, and when she went to her mother-in-law’s she felt she was being goaded. Kerry is seeking help from a GP, according to Ms Rowlands, and a supportive letter was submitted to the court from Kerry’s husband. Magistrates sentenced Kerry to a 12 month community order with 60 hours of unpaid work. She was also ordered to pay £240 in costs, compensation and a victim surcharge. Kerry also given a two-year restraining order not to contact her mother-in-law.